Having dragged out these Tokyo posts for far longer than necessary, I’m finally wrapping things up today with Nihonryori RyuGin, Seiji Yamamoto’s much-lauded Roppongi restaurant that gained its third star from Michelin last year and currently holds 29th position on the S.Pellegrino World’s 50 Best list. The more observant among you will notice Les Créations de Narisawa and Seryna Honten have remained unwritten – those I’ve snuck onto Facebook, along with other meals both in London and abroad that for one reason or another never made it onto the blog. Ok enough Facebook page pimping. Back to the meal at hand, and a very fine one at that. 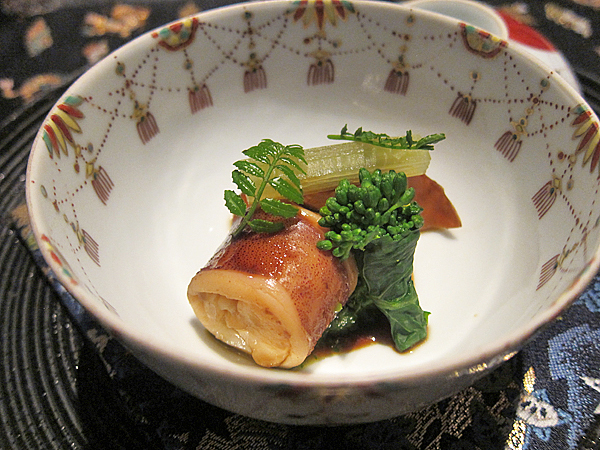 We opened with Charcoal Grilled Horse Clam and Icefish flavoured with Ume. 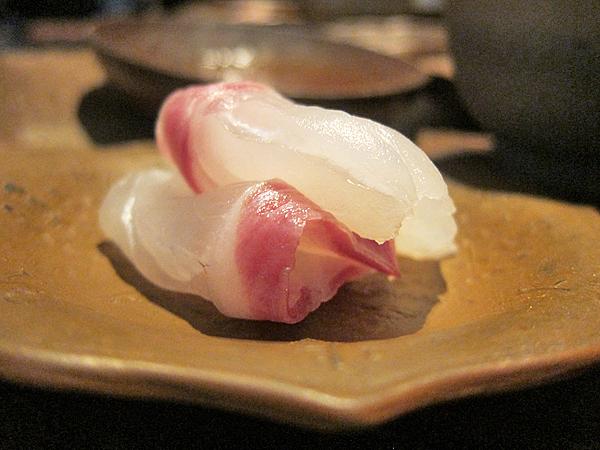 The clam was meaty, and the light fish tempura crisp and greaseless, with only a subtle hint of sour plum as to not overwhelm its delicate taste. 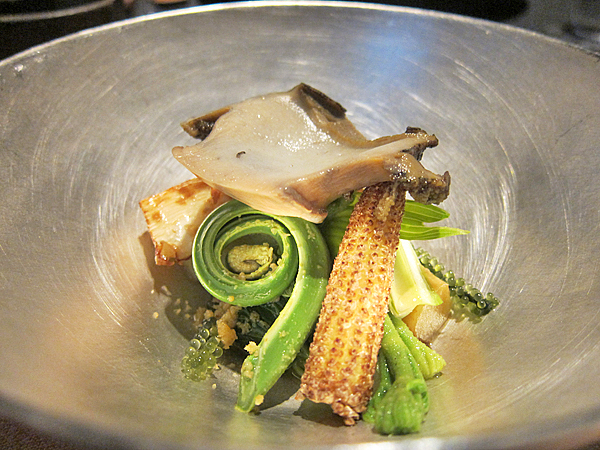 Assortment of Spring Vegetables with Simmered Abalone featured a thick slice of succulent braised abalone, umibudo (sea grapes) and crisp-tender bamboo shoots, fiddleheads, baby corn, and asparagus. 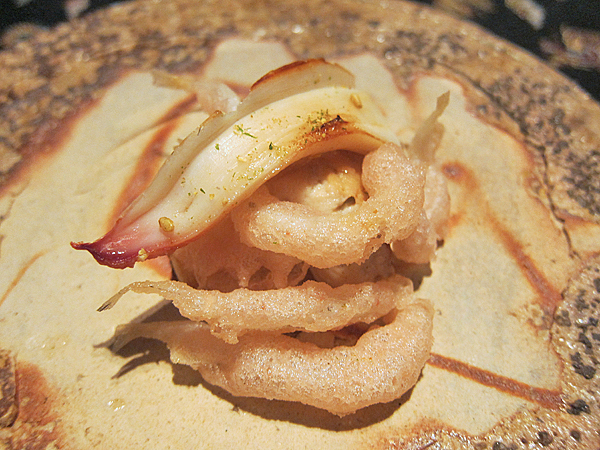 Next was a duo of dishes – White Asparagus with White Shrimp, and Fresh Sea Urchin with Lace Wrapping. 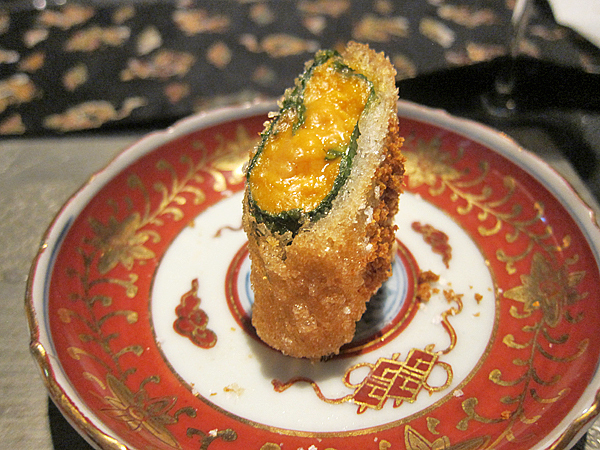 The first was elegant and restrained, while the latter – rich uni wrapped in shiso and encased in crumbly batter – was punchy both in flavour and texture. A great contrasting pair. 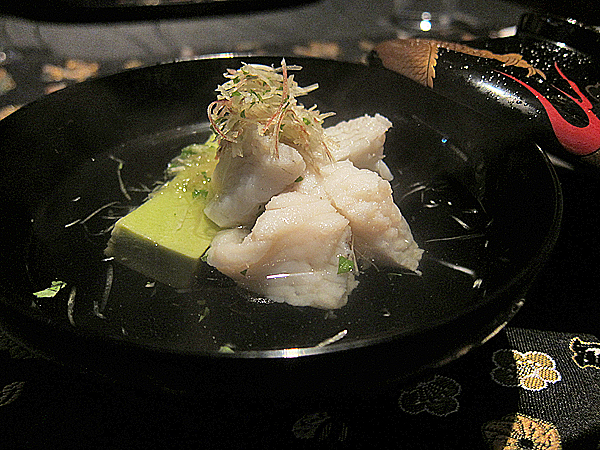 Ichiban Dashi Soup with Greenling Fish and Pea Egg-Tofu was a nourishing soul-warmer – fragranced with a whisper of Miyoga, it demonstrated a real lightness of touch. 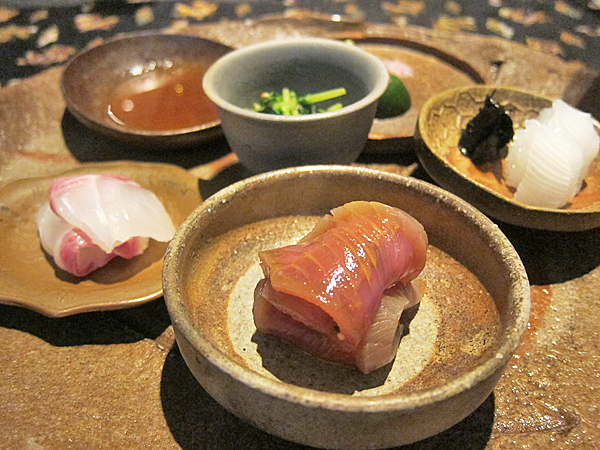 The day’s Sashimi selection included Sea Bream and Soy with Cherry Blossom, Tea-Smoked Bonito with Japanese Mustard, Squid with Nori, Lime and Salt, and Squid Fins with Pea Shoots. All spanking-fresh and beautifully accentuated by their respective accompaniments. 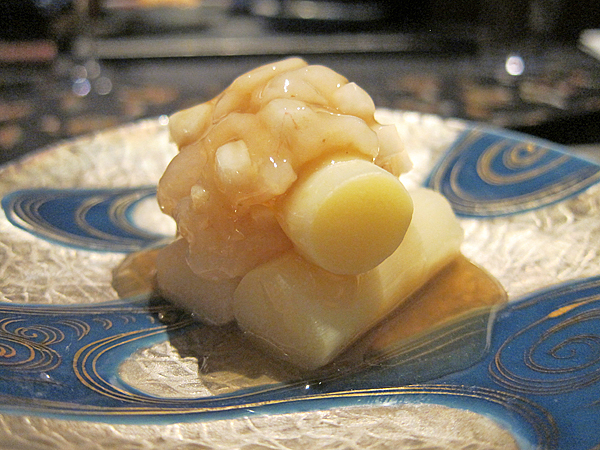 Simmered Yakira Squid from Aomori with its Eggs, Canola Blossom, Fuki Stem and Kinome flower was yet another delicious bite, the creamy egg stuffing adding depth and substance. 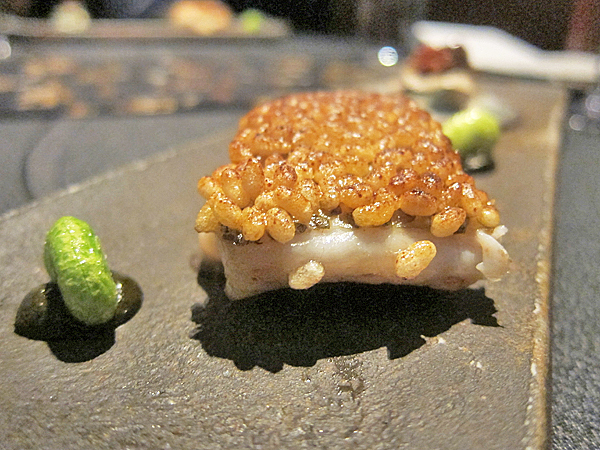 Yamamoto’s signature Charcoal-Grilled Sea Perch with Roasted Rice was simply exquisite – the crunchy black vinegar-glazed puffed grains coating the skin juxtaposed brilliantly with the soft moist flaky fish beneath. 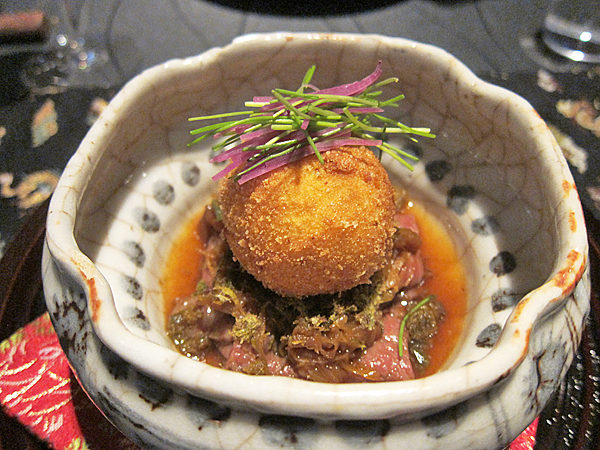 Kuroge Washu (Japanese Black Wagyu) Beef Sirloin Sukiyaki with Crispy Poached Egg and Fuki Leaves married two of my favourite things – marbled beef and molten-yolked egg. Glorious. Rice Simmered in Sakura Tea with Sakura Shrimp from Surugawan Bay, Pickles and Shrimp Broth Red Miso Soup was again, beautifully composed. 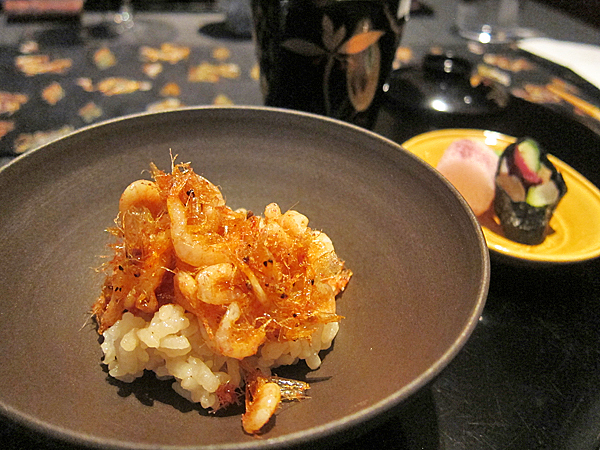 The shrimp, intensified in flavour by a brief round in the deep-fryer, complimented the fragrant mound of sticky rice. There was the option of an extra dish before sweets, which naturally we took. 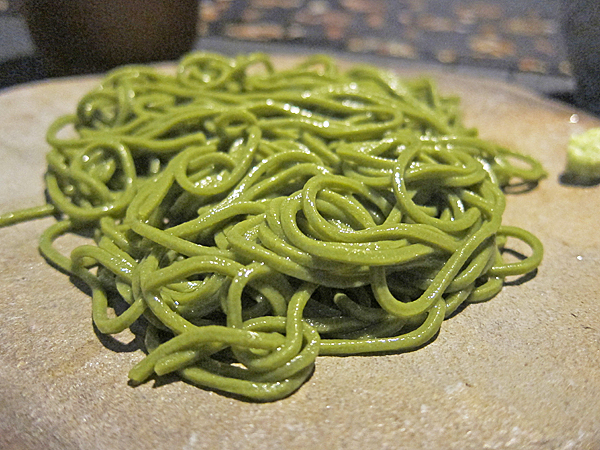 And we were pleased we did – vibrant green al dente strands of handmade matcha soba noodles served with wasabi and traditional tsuyu (dipping sauce). 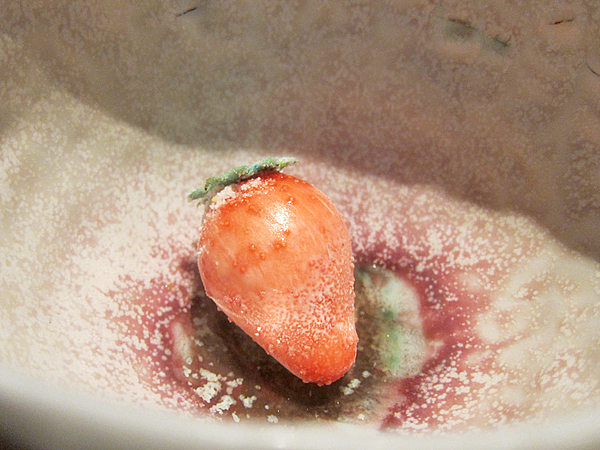 After the simplicity of the noodle course the skillfully-crafted whimsical strawberry dessert took me by surprise. The pretty pink “-196°C Candy Strawberry” arrived to the table whole. We were then asked to gently tap it to break open the translucent paper-thin sugar shell, revealing nitro-frozen strawberry sherbet. 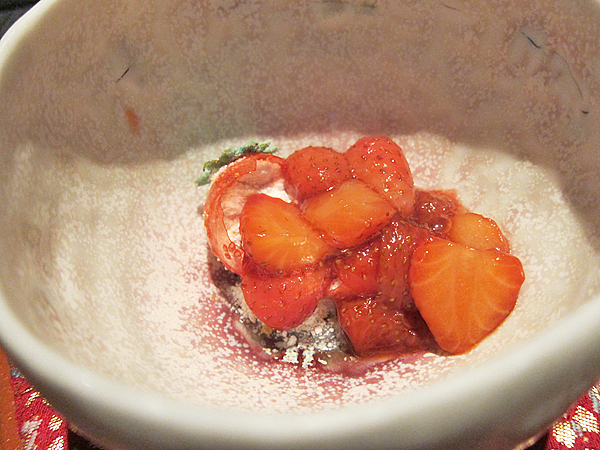 A “+99°C Strawberry Jam” was then spooned over it to complete the dish. 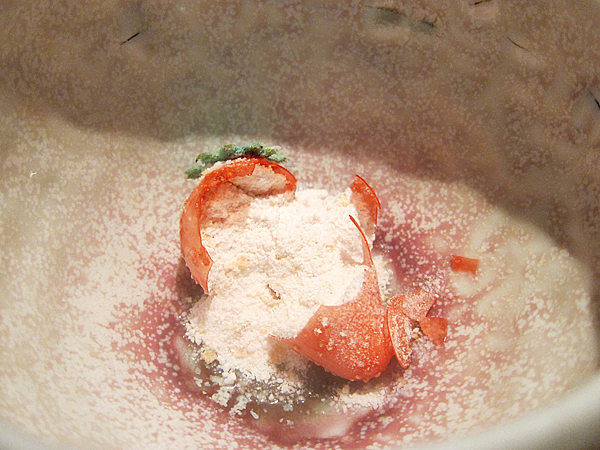 The combination of warm strawberries, cold sherbet and crisp sugar shards made for a delightfully playful mouthful. 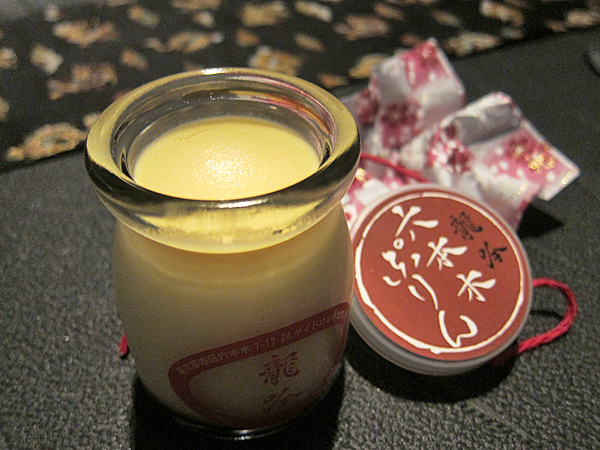 To finish was Roppongi Pudding (essentially a crème caramel) presented sealed in custom jars with a frothy bowl of matcha. A lovely end to an incredible dinner – impeccably sourced seasonal ingredients paired with technically faultless cooking that is both forward-thinking and steeped in tradition. ~ by gourmettraveller on November 14, 2012. The meal looks amazing.Nice photography too. Not sure about Squid eggs though….Oooooooo. The Strawberry was simply ingenious. Wasn’t it too cold though? Absolutely incredible food. First time I have ever seen battered uni, wonderful.